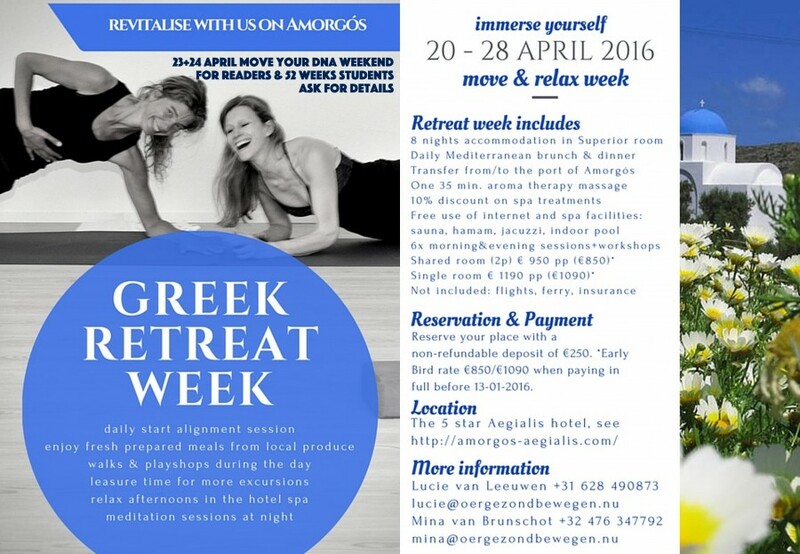 We, the alignmentgurus Mina and Lucie, are stoked to invite you to a week of paradise on the Greek Island of Amorgós from 20 to 28 April 2016. In April nature is at her most fertile on this side of the earth, bursting with life and juiciness. 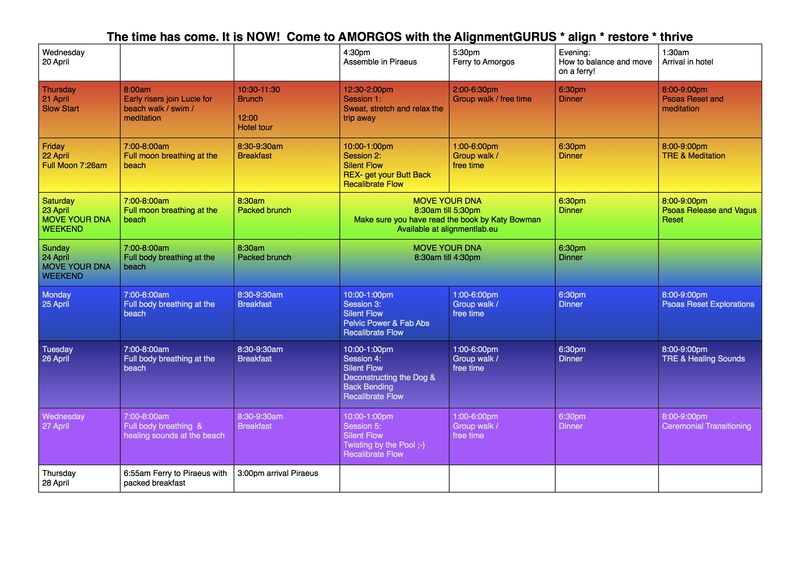 Come and join us for a week of movement, nature, nurturing food and Psoas Resetting. A week of MAGNIFICENCE! Nourish body-mind-spirit with local, organic and delicious food and move as your body was intended. Re-experience the feeling of every muscle, every cell being moved and fed, the utter relaxation of a bodymind that is growing and thriving and having fun. We have chosen a beautiful location, locally owned and operated where you can reconnect to nature, to your self, and to your community. We offer 5-6 hours of movement, meditation and alignment per day to challenge both your bodymind and spirit. Do you have an injury, are you a beginner or super advanced? Everything we offer can be tailor-made to fit your level. Wake up in paradise with a spectacular view over the Aegean sea. Amorgós is a remarkably unspoiled island, 33km long and 1,5-6km wide with 3 mountain peaks and excellent walking. There are several beaches meeting the clear blue and turquoise waters where you are invited to join us in early morning meditations and swims. Enjoy your free time in the spa, swimming, riding donkeys and exploring the island. Check out the hotel here. On average we offer 5 to 6 hours a day of quality movement. You are free to take plenty of free time for yourSELF, for extra excursions, maybe to one of the HUNDREDS(!) of monasteries, small villages, artisan workplaces, to visit nearby islands or just to hang out on the beach or by the pool. The hotel also offers cooking lessons and creative workshops. Fly into Athens, (Transavia of KLM -check http://www.skyscanner.net). The ferry to the island (Piraeus- Amorgós Aegialis) leaves on 20 april 2016 from the port of Piraeus at 17:30. Check the travel details here. Guests from Asia and Africa are advised to contact the hotel for their best port/ferry option. Breakfast buffet with organic food, local and home grown. Average of 5-6 hours of quality movement classes per day. One 35-minute Aromatherapy massage and 10% discount on all spa treatments. Send an email to mina@oergezondbewegen.nu or lucie@oergezondbewegen.nu to register. Once you have paid your non-refundable gepost of € 250,- per person, your place is ensured. The total amount (€950pp for double occupancy /€1190pp single occupancy) must be paid before 13 February 2016. Payment of the entire amount before 13 January 2016 entitles you to the EARLY BIRD DISCOUNT of €850 (pp double occupancy) or €1090 (pp single occupancy). If you are reading this after 13 February 2016 and are longing to join us – send an email, it may be your lucky day!!! 50% of the total sum when cancelled between 13 February and 1 March 2016. 100% of the total sum when cancelled after 1 March 2016.